Varsity Shop Training Center Summer Baseball Camps – Summer baseball camp instruction throughout Oakland County for kids ages 5-17 hosted by Varsity Shop Training Center. Youth baseball camps, baseball strength and conditioning, fundamentals, and fun camps will be held through the summer! The Varsity Shop Training Center and their training staff will put on a three day outdoor camp hosted at Rochester College that will focus on all fundamental skills including, hitting, throwing, base running, infield and outfield play. The Varsity Shop Training Center and their training staff will put on a three day outdoor camp hosted at Cranbrook High School. This camp will focus on the fundamental skills of baseball including; hitting, throwing, base running, infield and outfield play. The current landscape of beginning baseball has not been a productive way to introduce the sport to young kids. 12 to 15 players per team where kids get 1 at bat in an hour is not productive and not fun. Varsity Shop Training Center started a youth baseball league that moves at a fast pace to keep kids engaged. Their goal is to create game situations that can be taught on the fly and prepare kids for higher levels in the years to come. The biggest goal is to get the players excited about playing again next year, at whichever level that ends up being. The league is designed for youth/beginner players as an alternative to beginner little league, and Tee ball. Target ages are 6,7, and beginner 8 year olds. Volunteer Parent coaches will run the teams with facilitation from VSTC Staff. Players can sign up individually and be assigned to a team after spring training. Groups of players can also be brought in together to form a team or part of a team. Spring Training – two weeks of 90-minute camp with our instructors designed to teach players rules, functional skills, and run simulated indoor games. Built as a prelude to the 5 man ITB League by VSTC Director Chuck VanRobays this league is designed to teach the rules and fundamentals of the game while keeping it fast pace and fun. After the initial skill development segment of the program, the teams will rotate through live games and supplemental team development games. Sign up for Varsity Shop Training Center Summer Baseball Camps today. 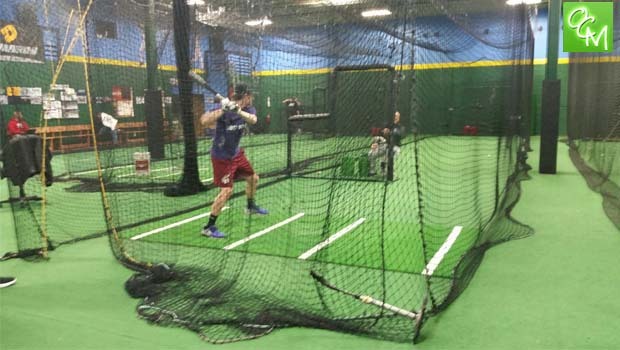 For more info on Varsity Shop Training Center Summer Baseball Camps, visit their website.